It is so easy to tell when somebody is suggesting concepts, laws or ideas where government power is reduced, private rights extended and the “deep state” has a tooth pulled, the person or group engaged in such tactics will invariably be called either a racist or a fascist if not both. These words are used as a rallying cry to engage the intersectionality engine so as to get all the other support groups to circle the wagons around their target and all engage their chosen chant pointing at their now vastly outnumbered victim while the words “racist” and “fascist” ring in their ears. The circled wagons are almost always a sign for the media to gather and quote the chanters in their articles making sure to emphasize that this capitalist or libertarian individual who believes in the rights of the individual over the rights of the collective has for now and evermore been labeled either a “racist” or “fascist” or received the worst charge, a racist fascist. There are so few other accusations which get broader use than racist and fascist, despite the fact that the people being harangued often are anything but what they are accused in order to dismiss their position out of hand. What need be understood is that “racist” and “fascist” are utilized instead of mounting a cogent argument proving that the leftist concept is superior, instead they simply label the person and all they stated as racist or fascist and that dismisses their ideas. Why bother with tedious arguments proving your point and ideas are superior, you are already convinced your ideas are superior and thus any other position is racist or fascist. Living on the left is an easy place to reside. Mostly, nobody calls you out and there are very few rules by which one must live. Once you have mastered intersectionality, which we discussed here as well as here, you then have a guideline of the acceptable causes and the remainder are fascist and racist by definition. The basis for being accepted on the left is to support every protest with equal enthusiasm even should you have no idea what the protest is demanding. The only other item is that you never condemn or criticize any of the other leftist causes included as part of intersectionality and you never ever support those causes which are on the short list of items which are forbidden. These include anything to do with securing the borders, forcing a path to work from welfare or limitations on how long one is allowed to collect government benefits and the most stringent rule is Israel is an evil, apartheid, racist and fascist enterprise to be reviled and anybody who supports Israel is to be driven from the ranks as they are unacceptable. Another item which must always be remembered is that criticism of Israel is always valid by definition and has absolutely nothing to do with anti-Semitism. You can demand that Israelis and their IDF meet standards which are not expected of any other nation because those Israelis, never Jews, always just Israelis though we all know we actually mean those Jews, believe and claim to be better than others, so make them prove this is so. Remember, every time the fascist and racist policies and actions of those Israelis are exposed, it is one more proof that every accusation we have made is valid. Further, anybody stupid enough to try and counter our convictions against Israel, by their actions and acts, they have proven that they are one of those Jewish supremacists who believe that the Jews stand above everyone else. Defending Israel is racist according to the leftists and their intersectionality. When the action was taken by the Israeli government, then it is not only racist, it is also another movement towards complete fascism which is how the Israelis rule their areas, just like fascists. They have elections where only Jews can vote, well, the Arabs are not permitted to vote, well, the Palestinian Arabs. They claim that they have their own government but we know the truth, that Israel rules them and will not allow them a voice because they are racists. Racism is easy to find. Whenever there is a Republican in the White House, that is a racist President. If that Republican President is actually accomplishing what he set out to accomplish, then not only is the government racist, it is also fascist. When a Democrat is in the White House, then everything, no matter what they have done, is considered to be near to if not perfect. If a Democrat President is being blocked by the Congress, then the Congress is racist and using fascist principles to block the word of the people. Anyone who votes for a Republican is racist and may actually also be a fascist. If one votes for the Democrats, then they are enlightened and intelligent. Republicans are always boorish racists and strong-arming fascists. Democrats are enlightened, intelligent and sensitive to the desires of the true American people. An easy way to remember this is, Democrats equals good and Republicans are always evil. This intersectionality thing is also easy to remember and works to one’s benefit. Any cause which has been accepted as meeting the qualifiers to be considered part of intersectionality must be supported by all other groups who have been accepted into intersectionality. These are easily recognized as they meet at the least much of the politics of the Democrat Party. But be wary, as there are certain protests and groups which do not meet the qualification of intersectionality and instead are bigoted, racist and very likely fascist. If you are at a protest and there are no people from the Rainbow Coalition, Boycott-Divestment-Sanction of Israel (BDS), Black Lives Matter, We Are the 99%, abortion rights activists, then you may have joined a racist, fascist and hate-filled rally. Remember, it is not about right or wrong, it is about one of us or the enemy. We on the left are wonderful, accepting, open to discussion (as long as you do not mind one talking in bromides and self-fulfilling circular reasoning), warm and only take strong stands against those things which are racist or fascist, something we allow our all-powerful and super-intelligent leadership to decide. Now the Democrat Party is involved in a movement of flux, a period where changes are taking place. The new face of the Democrat Party consists of people such as Bob Bland, Linda Sarsour, Carmen Perez and Tamika Mallory on the women’s rights front, with new members of Congress backing them up consisting of but not limited to Rep. Ilhan Omar, D-Minn. (who else would top this list), Senator Bernie Sanders D-Vermont (yes, we know he was born a Jew but even Jews have their misguided idiots), Rashida Tlaib D-Mich., Alexandria Ocasio-Cortez D-N.Y. (our chief editor calls her the gift which keeps on giving) and there were the standard bearers of the far left and the far right. The anti-Semites on the far right are not as dangerous as they are rejected by much of the mainstream conservatives. There are those on the left who will be shielded by the media and their fellow leftists as long as they stay away from obvious statements as have already gotten Sanders, Tlaib, Ocasio-Cortes and Omar, especially Omar, in trouble deep enough that even the media has had to call them out. There are two types of far right, also known as paleo-conservatives such as Pat Buchanan, who are anti-Semites and their main difference is where they place their Jew hatred. The Nazis and allied others place the Jews at the top of their hate list with Blacks and Hispanic close behind while the KKK and their ilk place Blacks and Hispanic ahead of Jews on who to hate. The leftists are a more unique breed as they place Jews at the top of their list and anything conservative closely behind. The leftists do not hate most other groups outside of Jews and are willing to accept Jews, tentatively at that, as long as they are willing to denounce Israel and support the Arab cause against the Jews. These Jews are the useful idiots, as should these people they are aligning themselves with ever gain control over the levers of power, it will not matter if a Jew supported their hate for Israel or remained Zionist; they will at that point simply see Jews and for them Jews are to be eradicated, not just hated. Examples of anti-Semites protected by the majority of those on the left include Al Sharpton, John Lewis, Eleanor Holmes Norton, Maxine Waters, Sheila Jackson Lee, Danny Davis, Andre Carson, Cory Booker and many other members of the Black Congressional Caucus. What makes this so sad is that the Jews marched right alongside Blacks in the Civil Rights movement as they saw this as a mutual concern. That generation of Blacks who knew these Jews are no more and their next generation did not know these Jews just as the new Pharos did not know Joseph. This has led to one of the most drastic and quick turnarounds in political history as the Blacks went from joining with the Jews to being diametrically opposed to the Jews and the Jewish State. Making this turnaround even more tragic is it only occurred for one side as the Jews still support equal rights and freedom for all. Thus it has become that should a Jew support Israel, they will no longer be permitted to even join protests for other communities which became so very evident at the Chicago Dyke March where LGBTQ Jews who arrived with rainbow flags with a Star of David were banned, scorned and belittle as not being true to the cause as they apparently supported the racism and fascism that is presumably Israel. Because their flags had that abhorrent Star of David, these supporters were rejected and denied the right to march for a cause which they were just as involved and ardent about as the other marchers. The problem is that they were considered to be antagonistic to the Palestinian cause and supportive of Israel. This crosses the intersectionality agreement where in order to be accepted, one must accept those causes which are acceptable to the rest of the leftists and if one should break ranks in any means, then they are no longer permitted to enjoy the right to protest which is a denial of their right to free speech. I asked them (Arab League members) how Palestine was lost. It had been lost for two basic reasons: one, because we deluded ourselves by underestimating the power of our opponent and by thinking that the Jews were not powerful. The highest official in the League said that with 300 soldiers or North African Volunteers we could throw the Jews into the sea. The war started and His Excellency then said that with 3,000 North African Volunteers we could throw them into the sea. The second reason was that we thought that we were strong enough to face the world but the fact was that we did not estimate our own strength correctly. This then was the issue of Palestine. It seemed a trifling thing at the time but we did not know that behind the Jews of Palestine stood World Zionism with its resources in every major country. We could easily contest the every major country part of the statement as the only nation to provide weapons which Israel desperately required in 1948 was Czechoslovakia. The commonly made statement that the United States has always stood behind Israel is patently false. 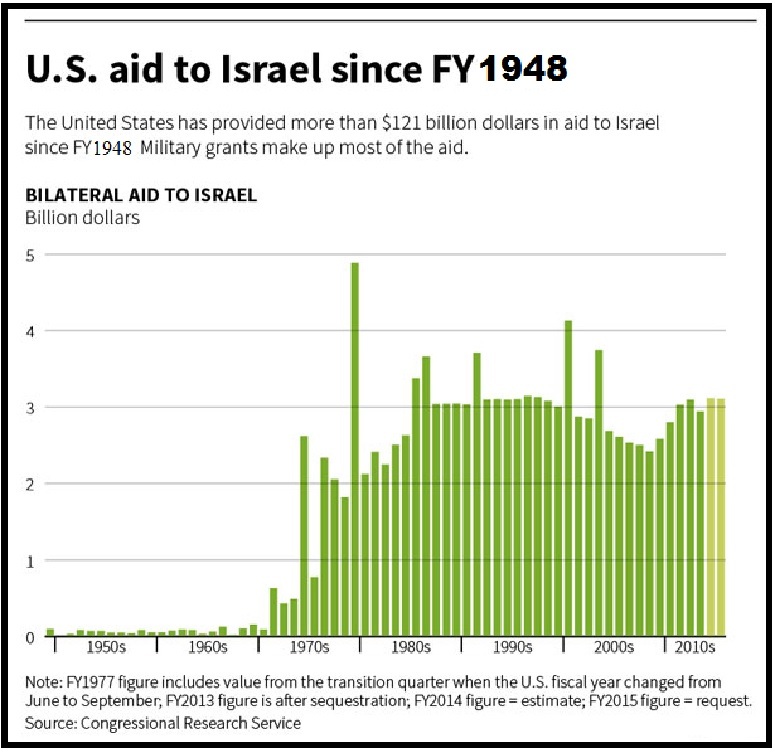 This can be proven with the simple graph below which depicts the total aid given Israel by the United States by year and one can easily see that United States aid to Israel did not become a major factor until the early 1970’s. Allow us to explain the situation with Israel by a simple analogy. You receive information that there is a group of a couple hundred people in a field a mile from your house preparing to come and burn your house down. What would you do? Call the police, right. Where the police would tell you there is nothing they can do until a crime has been committed and that you can call back once they have started, you would get upset and still they would claim they will send a car by. They won’t. But these people who wish to burn your house down want to intimidate you first, so they stand surrounding your house and start throwing rocks through your windows. Now, when you call the police, they will hopefully respond. This is the case with Israel. The Arab world has wanted to burn our house down for over one-hundred years, even before we had fully moved in and declared the house ours. They had this strange habit of screaming warnings and threats and launching projectiles while massing on the Israeli borders. The police Israel calls is the IDF, and as they take orders from the people placing the call, they respond quite quickly. For some strange reason, probably we have found that when the Arabs claim they are going to come to dispossess us of our homeland and kill most if not all of us in the process, they mean it and will attack very soon. So when this happens we call the IDF, they respond, and then the media will cover the attack by Israel. Meanwhile, they had largely ignored the projectiles launched into Israel and the fields which were burned down costing farmers that year’s crop and burned down orchards which take many years to replace as well as forests and game reserves. This was not worthy of a report in much of the media. But as soon as Israel attacks, then come the headlines which tell the entire story, except the part about the past three months of rockets and other projectiles launched into Israel are in paragraph twelve of the fourteen paragraph story because research has informed the media that the third from the last paragraph is the least read in any article over eight paragraphs. Tricky, those media people, tricky they are. The last Gaza war, Operation Protective Edge it was called, before Israel attacked with ground forces, over two to three thousand rockets had been launched into Israeli cities and it was not until the daily numbers exceeded one hundred per day and Hamas and Islamic Jihad began using their largest rockets targeting Haifa, Jerusalem and Tel Aviv that Israel responded. Another misrepresentation is the media claiming that Israel sends in ground forces in order to maximize damages and casualties. The reality is exactly the opposite. Israel sends in ground forces so as to target only combatants and to minimize civilian casualties. We need to point out that the Terrorist rulers of Gaza will remove the ammunition, weapons and identifying markers from a dead terrorist and then call the media to take pictures of the latest civilians killed. If Israel so desired to minimize IDF casualties, she could sit outside Gaza and use aircraft, naval artillery, and tanks and level all of Gaza killing tens of thousands and largely not lose any IDF soldiers. Israel does not take the indiscriminant mode of simply kill everything and instead sends in ground forces who will enter buildings to assure that the target they shoot is a combatant as often the snipers force entire families to sit with them as shields. Lastly, the accusation that Israel is racist because they only target Arabs and Muslims is false. First, there are Arabs living in Israel who are Jews, Christians and Muslim as well as other faiths. These people are treated exactly the same as every other Israeli. For those who refuse to believe such, we invite you for a visit or a few weeks or months to see for yourself. Yes, we treat the Arab Palestinians differently just as the United States treats Mexicans, Canadians and North Korean differently. The Arab Palestinians inform us with their every broadcast that they are our implacable enemies and want us all dead. This is not exactly the form of activity you perform if you wish to be accepted. Yes, they go through checkpoints as they are entering another nation from a semiautonomous zone if they are living under the Palestinian Authority and a separate nation completely free of Israeli interference except when they push for a war, something they are currently threatening and Egypt is desperately attempting to stave off such an eventuality. Israel left all of Gaza even to the point of reinterring our dead within Israel otherwise, they would have been dug from their graves and desecrated. We left millions of dollars worth of functioning greenhouses already planted so they could have a start at an economy. The greenhouses were destroyed and the piping turned into rockets and sent back to Israel with an explosive charge atop. The rockets launched from Gaza are seldom targeting any military target and instead are intentionally targeting civilian locations. Hamas and Islamic Jihad claim that every Israeli from the unborn to someone over one-hundred years old are all combatants because every Jew in Israel desires killing an Arab. This claim is the greatest example of projection one will ever find as the Quran is interpreted by many to guarantee a Muslim be placed in paradise should they murder a Jew. It does not matter if the Quran actually guarantees paradise for the murdering of a Jew, it only maters that they believe the Quran promises them this. If the Palestinian Arab is from the Palestinian Authority and murders a Jew, they and their family are guaranteed a payment, for as long as Abbas can find the cash, into perpetuity, and it is a very healthy check which guarantees one’s family living the good life. This is important in an area where jobs are scarce and becoming more scarce thanks to the BDS movement. Those “evil” Israeli companies beyond the Green Line employ tens of thousands of Arab Palestinians at the same rate the Israelis earn and at these plants, the Arabs often are managerial position and have Jews working under them. Each time the BDS succeeds in closing one of these companies, hundreds or even thousands of Arab Palestinians lose their well paying job. When SodaStream relocated inside the Green Line, five-hundred Arab Palestinians lost their jobs. Finally, we hear about the fact that Palestinians go through checkpoints in order to enter Israel, ever wonder what Israelis have to do to enter the Palestinian areas? 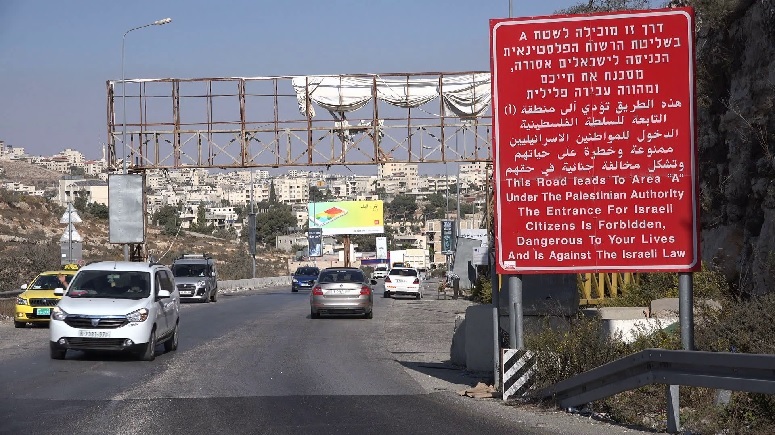 Well, here is a picture worth a thousand words which depicts what an Israeli is told about entering the Palestinian areas, and the information on the sign is beautified compared to the reality if they were caught within these areas. We hear much about the split between right and left political parties and individuals. With a media fed by leftist academia, there is the dual-attack on everything not progressive, the new word which replaced liberalism because liberalism had its name destroyed and tied to failed policies. The interesting thing about this change is that when the progressive politicians had destroyed the name of progressivism, at that time they changed their name to liberals hoping that their ideas and policies could be sold as liberating instead of the stifling which progressivism had come to represent. It was Hillary Clinton who referred to herself as an early Twentieth Century progressive when she attempted to strip herself of the liberal label. This worked almost well enough for her to win the Presidency on her second try. She was counting on the fact that most people have little recollection of what exactly was a progressive of the early Twentieth Century and thus she could define herself as the candidate for progress. This has been the systematic redefining that the socialists have had to do to avoid being labeled exactly what they are, Statists. The progressives, and the liberals after them and now again with the moniker progressives have always stood for has been socialism and the empowerment of government. They offer programs which sound marvelous and all inclusive but these programs are all based on one simple concept, the government must be the provider of rights and all means of survival thus having the power to decide who lives and who does not. Gaining this power, despite the claim that they are empowering women, comes through in the abortion debate where the plans of Margaret Sanger remain alive and well within Planned Parenthood, to remove the unwanted types of people from the society through sterilization and abortion preventing their reproducing. This is also central in the discussion over euthanasia of the terminally ill and the elderly. What is almost always refused entry into this debate is the speed with which medical discoveries and breakthroughs are being made and how this will only become more miraculous with time and thus some who may choose to be euthanized may do so only to have their loved ones read of a new miraculous cure or treatment which could have returned their loved one to a productive and healthier life which could have continued for decades. The newest discussion in these areas has been the right of a parent to abort a disabled child after their birth simply because they are not prepared to make the sacrifices required by their infant’s disability or illness. Thankfully, this was not the custom when Ludwig van Beethoven who was almost completely deaf, and as such in his time was most definitely a difficult imposition on his parents. By the standards being touted today by the left, one such as Beethoven could be considered not worthy of the effort to be permitted to live. While reading an article which took a slightly differing approach to the difference between the left and right, as stated in this article the difference was between Leftism and Americanism, an odd and not too sophisticated movie, which was amusing just the same, came to mind called, “Idiocrasy,” about life in the far future. We are not recommending rushing out to order this on Netflix or any other means to view it, that is unless you have some time to waste on puerile enjoyment and flatulence jokes used to set the level of the society and not intended to entertain. In the film, a not so intelligent soldier and a woman who volunteered for the financial reward end up in the 2500’s, where the society has all but collapsed due to government programs and regulations ruling every part of life and the general dumbing down of the population reaching its logical conclusion. The rest is unimportant beyond the fact that this is where every experiment by mankind has led to, or would given sufficient time, where the government gains total control over every facet of life, the means and methods of production and virtually everything is regimented by rigid regulations. Somehow, in Idiocracy, it led to humorous institutions run by ignoramuses where television shows of the basest variety are more important than working or virtually everything else. The world, by rule of law, is restricted to using an energy drink for everything for which Hashem gave us water and for some reason they are unable to grow food, yet everyone still eats. This comical look at a total socialist existence which had been in place for quite some time and where it invariably would lead is, in its own way, educating. The reality of government dependence and reliance solely on the government to fix every little problem is that people will tend to lose their motivation to actually perform any actual service to the society. Socialism works well in small groups which have a common goal and where there can be societal shame used to motivate any slackers. Further, in a small group such as communes or the Israeli Kibbutzim, members who are not pulling their weight and have no specialized skills making them worth carrying are often invited to leave the group and try being shiftless elsewhere. Such a control mechanism does not function with such means as shaming in a large, metropolitan society where often people know absolutely nothing about their neighbors. Also, when the goodies provided by the all-powerful government includes housing, then those who are completely dependent upon the government for their food, shelter and all other necessities end up residing together where their way of life is the norm and thus shaming again is useless, or in this case, nonexistent. Currently, there are two shining examples of a completely socialist governance and where such leads, and they are North Korea and Venezuela. There is another item such societies posses, and that is a complete ban on private ownership of firearms. This makes the people completely dependent on government and with no power to resist any policy. They also make resisting anything the government may decide is necessary to continue ruling including deciding that certain people no longer have any right to exist. This can lead to the extermination of an entire group in any random basis such as the Nazi near extermination of European Jewry, and the Nazis were socialists, National Socialists. Currently, in both Venezuela and North Korea, people are starving and without their medications or any of the niceties of life such as toilet paper. Changing the leadership in either nation or infusing capital in an attempt to restart economic activity will result in throwing good money after bad as they will slowly grind their economic engine to a halt in order to serve government programs. There is another oddity which we and some of our friends have discussed at length and come to what originally we thought was something odd, but later we reached some conclusions. The item we noted was that the people supporting leftism and the socialist agenda mostly resided in the larger cities while those who supported individualism, capitalism and such were those in the rural communities. This appeared perplexing, especially since we all resided in larger cities and would have politically stood with those from the rural areas, so obviously this was not a universal qualifier. We finally hit upon the differentiating factor, or at least we settled for this reasoning. Disclaimer, we are not necessarily the sharpest knives in the drawer. What we found was that in each of our lives, should something break or if we did not have the exact item needed to complete some task, we would improvise and get the item functioning or complete the job and then, when it was more convenient, we would go and get the correct item or fabricate some elaborate piece and actually repair or complete some task. This did not mean we would use a roll of pennies instead of a fuse in our homes, but we would wrap a gum wrapper around a fuse in something like a flashlight to get it to function when needed and later replace the fuse. None of us admitted to doing such with the fuse in a vehicle, but we all knew that at least some of us had probably committed such a not so brilliant fix. The people we all knew who were avowed leftists, and yes, we managed to remain friends with such people because they can be perfectly wonderful people and even good friends, until something breaks, but we avoided talking politics with them as we realized long ago that leftists must find their own path taking them off the government plantation. Truth be told, some of us were once leftists and have found our way to self-reliance. And that the term which most often delineates leftists from those on the right, is self-reliance. It actually comes down to do you at least try to repair things yourself or do you wait for a repair person to come and repair it because they were trained for such jobs. We noted another difference which was less obvious and had a greater number of exceptions. What we noted was that most of the leftists worked either in a union, an office, or some regimented type of work where people were, to varying degrees, interchangeable while the more conservative people worked often in some form of repair or technical work and often for smaller companies where each person has their particular specialty which adds to the whole and all are able to perform multiple jobs required by their employers. What we were never quite able to get our arms around was why the vast majority of highly educated university graduates were almost all leftists, and the more education they had and the more advanced degrees they had attained, the stronger this attachment. This may be due to our age and the majority of these highly educated varieties of people we meet are often twenty or more years younger than ourselves. We also had noticed that the highly educated which were closer to our age were more likely not to be leftists and abhorred socialism. We might have fallen into the trap of believing age has something to do with political views, but we know far too many people our age who are committed leftists. These other descriptions appeared to be somewhat more accurate and telling. We understand the concept of assisting the poor, especially those who have some disabling difficulty which prevents their being gainfully employed. Special instances must not become generalized privileges available to the general public at large. We understand the necessity for taking care of the elderly, but this too is not universal as there are those of advanced age who are still fully capable and there are some who prefer working to taking a government handout. It is for these people that we oppose age restrictions such as mandatory retirement age. Some people can be unable to functionally work due to age and other related injuries and complications at age forty-five while other people are still vigorous and fit at age seventy plus. One-size fits all rules are seldom a great idea as, in case you may have missed this, people are all different with different needs, abilities and desires. This is part of the problem when the government makes rules for the society; these rules are, by necessity, one-size fits all. What is interesting is that those who make these rules always find some means of excusing themselves from the same rules. The example which has always upset us and our friends was when regulations and rules were passed to make insider trading of stocks and bonds illegal, the legislators of Congress and their senior aides and advisors, you know, the people most likely to have insider information and even information even insiders do not have access to such as who is about to get the big defense contract, these people were exempted from all prosecution for insider trading. This should provide everyone with the answer as to how people after four years in an elected government position or high post for an elected member of the government become multi-millionaires when they were almost dirt poor upon entering office. Rules, what rules, we are the governing, not the governed, we do not have to obey the rules. Members of Congress cannot be ticketed for speeding or other driving violations as long as they are on their way to the office, that is another great rule which is just wrong. These are just a taste to get everybody upset. The other item you will see is even in Venezuela and North Korea the leadership and their friends and the military eat and live well, the closer to the leader, the better one lives. Socialism is all for equal treatment of the common people and not of the privileged people. Those who matter, matter and those that don’t, don’t, it is that simple. 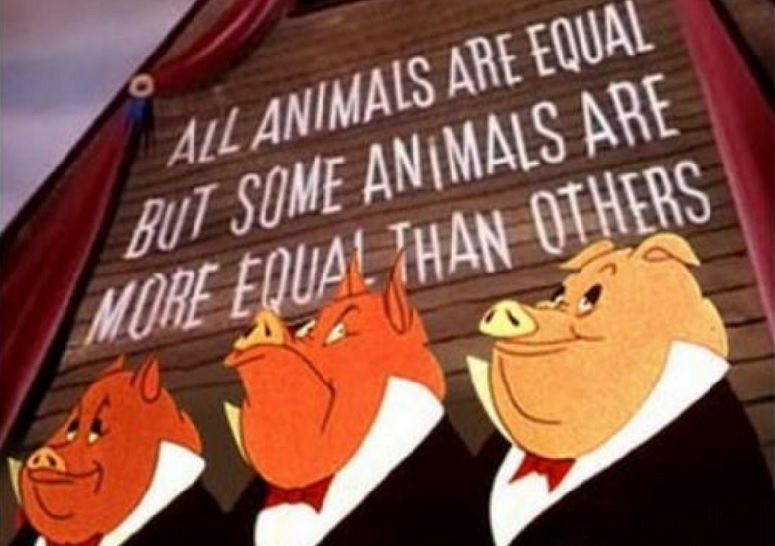 To quote George Orwell’s “Animal Farm,” “All animals are equal, but some animals are more equal than others.” To that, we need add nothing as if you do not understand this, you will never understand socialism and the privilege of the governing, something relatively valid no matter the governance. All governments will tend to grow and once they pass a certain size, they are next to impossible to bring back under the control of the people as they have amassed too much power and the ability to know far more than is required to govern about every individual and more so once you become a person they find interesting, gain ballot access to Congress and you will find out exactly how interesting you can become. Thomas Jefferson stated, “The government which governs best governs least.” Unfortunately, the government which will govern least is the one with the least number of employees. When it comes to government, the first thing that matters is whether they are capitalist or socialist, the next is whether they are elected or some form of plutocracy, and finally, no matter what you have heard, size matters. After these three items, the rest can be diced out by the people for the government still belongs to the people and not the people to the government. All of these things are small if taken one-by-one but together give many a large amount of latitude to be overly critical of Israel. Where Israel is not perfect, and what nation is, she is not the main difficulty in the world as so many make out she is. Where being critical of Israel is not necessarily a sign of anti-Semitism, when somebody makes special rules for Israel, only criticizes Israel and no one else, blames Israel for actions others took or that Israel did not commit and other such variations of these or anything where Israel is being harshly criticized unfairly, that is anti-Semitism. There is a means for determining if criticism of Israel is anti-Semitism called the 3D Test of Anti-Semitism which was designed by Natan Sharansky, and these 3D’s are Demonization, Double Standards and Delegitimization. These are relatively obvious and make for an easy means of judging if the condemnations and complaints people put forth about Israel fall under anti-Semitism. There is another which did not fall within Natan Sharansky’s definition, and that is obsession. If a person obsesses over Israel and solely Israel and Jews generally, you can pretty much bet you have an anti-Semite in your midst. This takes knowing somebody for longer than one or two demonstrations and can be easily ascribed to people with whom you work, socialize, play sports with regularly or anyone with whom you have a regular reason to be in contact and you get to know their likes and dislikes. Then there is the anti-Semite who never quite comes out and says anything derogatory about Jews but always leaves a hint that this is what he means but always comes up just short of actually committing it to words. Such a person will likely have other prejudices which he will speak around in very much the same fashion. We have found that these are people with whom it is best to leave a fair amount of distance from oneself. The New anti-Semitism has taken root in the far left, with most leftists and the minority rights movements. 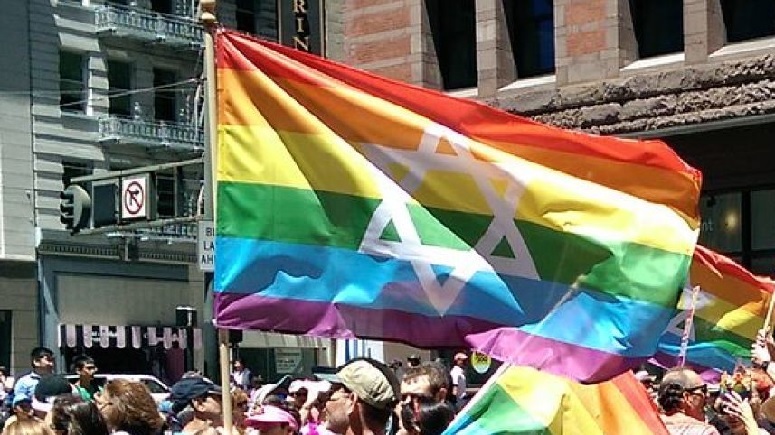 As we have noted recently, the women’s movement, specifically the Chicago Dyke March, refused to permit a number of lesbian Jews from marching because they had a multi-colored flags with a Star of David (see image below). What has occurred has been the imposition of a concept called intersectionality. By this definition, if you join one group on the left, then you must support all the groups on the left, and this has been applied very stringently within the minority rights action groups. The other side of the equation is that if you oppose any single one of the groups which have been deemed appropriate to be included in intersectionality, then you are opposed to everything within intersectionality. The pro-Palestinian position has been graced with inclusion within intersectionality and any position which does not condemn Israel, let alone be pro-Israel, has been deemed as against intersectionality and thus is completely unacceptable to these favored groups. More simply put, no Israeli flags, no Stars of David, nothing which is too Jewish period. But isn’t that just a tad anti-Semitic? No, not according to the definers of intersectionality, it is the logical position against White Privilege, and anti-colonialism, and minority rights, and anti-Capitalism, and simply the right side of history as described by the alt-left, as we like to call them, or leftists if you prefer. This denotation was introduced by the likes of Linda Sarsour, Tamika Mallory, Alexandria Ocasio-Cortez, Carmen Perez, Bob Bland and Symone Sanders from the planning group of the Women’s March had connections, made positive remarks on social media praising, defended those who had been found affiliated with or had other links in some manner to Louis Farrakhan. Of course, as soon as this became an issue, they all gathered together and met with a selected group of leftist Jews and all was forgiven, it is for the cause, you know. But this was how intersectionality became a filter to keep the wrong kinds of Jews out of the approved peoples list. Supporting Israel is just so, well, just so Trump. This will filter through the leftist circles and soon will become a non-issue because the people who require receiving the message will either mend their ways and forgo any support for Israel or realize that they no longer have a place where they had believed they were welcomed. So sorry, the leftists have decided that Zionism is a terrible disease and that if you have this terrible disease of Zionism you must be excised from the group before you contaminate somebody else. Their minds are all made up because, well, Linda Sarsour, Tamika Mallory and Alexandria Ocasio-Cortez are so completely knowledgeable and they have spoken and there is no turning back, especially for a bunch of those people. Trust us, Linda Sarsour at the very least is a true-blue, through and through anti-Semite and she knows from where it comes, her Quran and her association with numerous Islamic groups. Alexandria Ocasio-Cortez initially expounded very supportive expression for the Palestinian Arabs and desired that all aid to Israel be cut off as they were an occupier and were committing genocide of the poor and unfortunate Palestinian Arabs. Ms. Alexandria Ocasio-Cortez, Israel has had over fifty years where we have had relations with Palestinian Arabs, so if Israel were committed to their genocide, why are any of them still alive or do you believe that Israel is simply too incompetent to accomplish such a task if this were an actual policy. The evidence that you still have a large number, actually one that has been increasing over the past fifty years, to take their side is proof positive that Israel is not carrying out any form of genocide or even persecution, but why allow reality to confuse your views. This new form of anti-Semitism on the left has been powered by Arab money, George Soros’s money and the money of many leftist amongst whom many are Jews some of which do not know any better and others who agree that Israel is evil. Those Jews who are ignorant of what is happening had best awaken to reality before it is once again too late. What is starting with the shock troops out protesting President Trump often with a fair degree of violence and the creeping anti-Semitism in the left wings of the Democrat Party and completely permeating the Social Democrat Party which is vying to take control of the Democrat Party, is something which should be recognizable to anyone with a basic knowledge of history. No, it is not a repeat of the Nazi takeover of Germany as history does not repeat itself, it simply writes a poem with the same rhymes. This more closely resembles the events with the Persians and why we celebrate Purim and read Esther’s Haggadah. The main difference is instead of Haman and his sons, there are Islamists and other anti-Semites which means that there are a much bigger number of Hamans and sons and that number is growing just as the anti-Semites grew backing Haman. When the wrong Democrats gain sufficient power in the Congress and the wrong Democrat becomes President, things could become very difficult and even take a turn for the absolute destruction of Constitutional rights and maybe even Constitutional government with the Constitution being rewritten such that the Electoral College is eliminated and the President becomes elected by popular vote, the borders are soon opened wide to all who desire to enter and these new immigrants are given blanket amnesty and instant citizenship. Their registration will be assigned to be carried out by a special group which will employ only those groups accepted by intersectionality as such a task requires people with open minds which have the correct-think down and would not infect these new citizens with any strange or dangerous ideas. The warning which I have been sounding beginning in the middle of the 1960’s and ever since despite being told by the vast majority of Jews in the United States and the majority here in Israel since I arrived, anti-Semitism is growing at an alarming rate in the United States. Initially it was the variety which was relegated to the alt-right. Now it is growing like kudzu in the alt-left, the leftist and pure socialist camp. This new anti-Semitism is far more virulent and thus unbelievably more dangerous and if left unchecked, it will engulf the United States and eventually join those on the alt-right if only to use them as foot soldiers. These leftists have already infiltrated into school boards and position which decide on which textbooks are bought and which lesson plans are used and are using these positions as a power to influence the minds of the children. The “intellectuals” in the ivory towers are taking these far leftist positions to heart seeing it as the future. This includes the hatred for Israel which is rapidly morphing into outright anti-Semitism. Campuses have had demands that Jews denounce Israel, fly the Palestinian flag from their dorm room or on their door. Any sign of Zionism often will meet with a violent reaction and these altercations are never mano-a-mano, they are six or more to one. I will be called a fool once more and hope that I truly am a fool tilting at windmills and calling them dragons. My problem is slowly I am finding others who are seeing pretty much exactly, what I am seeing and that frightens me because often I really wish to be wrong, and this is one of those times.